The family of Louis Paul Jonas is looking to sell his private collection. This is a summary of who he was and what is included in his collection. Museums are our main target, but private parties will also be considered. Louis Paul Jonas was a master sculptor, taxidermist, and exhibit designer who made many groundbreaking contributions in all of these fields. Among these contributions, he was the first person work with a leading paleontologist to sculpt anatomically correct, life size dinosaurs; he developed an innovative way to mount elephants for taxidermy exhibits, and he transformed exhibit design by creating lightweight fiberglass shells on which backgrounds were painted. From his work on the Akely Hall at the American Museum of Natural History in the 1920's to his 9 life-size dinosaurs sailing down the Hudson River on a barge destined for the 1960's Worlds Fair, Jonas' accomplishments touched millions of people. He is truly one of America's most talented artists. 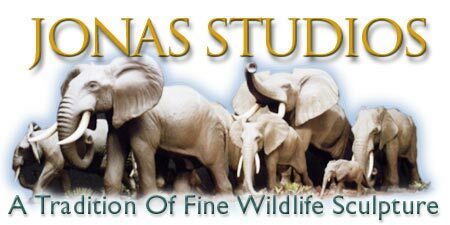 Jonas Studios continued to reproduce his works for years after his death in 1972, but with changing times, the small studio has decided to close its doors. The only remaining commercial art studio of its kind, visitors could feel the history as they saw remnants of his work in lofts, on shelves, and tucked away in closets. Our goal is to preserve his legacy and find a suitable place for his work to be on public display again. The following links lead you through a photographic inventory of what we have. There are more pieces packed away that we where unable to get to at this time. His daughter Zella Jonas Merritt has written a book, which is waiting to be published, and we have been producing a documentary film using archival footage and are seeking distribution channels. The archives comprise 1000’s of photographs, Family papers, Research Photos, Drawings / animal sketches, Exhibit design blueprints, financial records Business correspondence, Audio taped interviews, Documentary films. The miniatures are broken into two files. One is a close-up tour and the second is an overview of the collection . This is Jonas’ personal collection of his miniatures that where sold through retail stores from the 1930-1995. The collection has been discontinued. Many dioramas using the 1/10th scale miniatures fashioned for museum use. There are several more not pictured. Paintings from various artists he was associated with. Life size molds of 10 dinosaurs and a Mastodon. A collection of 1/10th scale Marquette’s of the Sinclair Dinosaurs and other dinosaur designs. Many 1/10th scale prehistoric mammals. A clip from our project. Jonas’ daughter Zella Jonas Merritt has written the book co-authored by Stuart Murray. It contains historical information along with numerous photographs from the archives and other institutions. Thank you for reviewing this information. We look forward to your response, comments or recommendations.